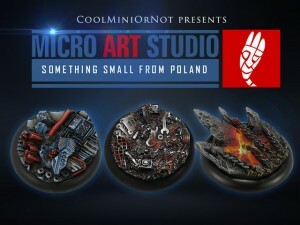 CoolMiniOrNot has teamed up with Micro Art Studio to launch a new line of gaming bases. The Kickstarter just got underway, so go check it out. Most decorative bases are designed as one piece, with terrain molded on top of a beveled game base. The CoolMiniOrNot system is actually two pieces. The first piece is a highly detailed terrain insert. The second piece is a black satin base, with a recessed center that holds the insert. This two part system creates a cohesive and beautiful base for your miniatures.